"Something sinister lurks in the depths of planet Tallon IV. Interstellar bounty hunter Samus Aran is the only one who can destroy this evil... but first it must be found." Please note that this page and links to it are meant to cover the first game only. The link titled Metroid Prime Trilogy is for the sub-series as a whole. Metroid Prime is a 2002 First-Person Adventure for the Nintendo GameCube. It is the fifth game in the Metroid series, the first of the Metroid Prime Trilogy, and the first Metroid game to be in 3D. It is also the second game in the frachise's fictional chronology. The story takes place almost immediately following the events of Metroid 1/Metroid: Zero Mission. Samus Aran is on the warpath. After destroying the Space Pirates' base on Zebes along with the Pirate leaders Mother Brain, Ridley and Kraid, Aran relentlessly pursues the scattered fleeing survivors across the galaxy and ultimately tracks them to their fallback position on the Wanderer-Class planet of Tallon IV, located in the same star system as Zebes. There, the Pirates have set up a secret research base, where they have resumed Metroid cloning, started reconstructing Ridley's heavily injured body, and are harvesting a new power for their own ends; a radioactive mutagenic substance called Phazon, containing nigh limitless energy potential. Adaptation Induced Plothole: Inverted with the final boss. In the original game, Metroid Prime had been captured by the Pirates and studied for a while, before breaking loose and returning to its point of origin, explaining its fancy assimilated Zebesian tech armor. The problem is that said point of origin is behind an impenetrable barrier you spend most of the game deactivating, so how did it get out and back? 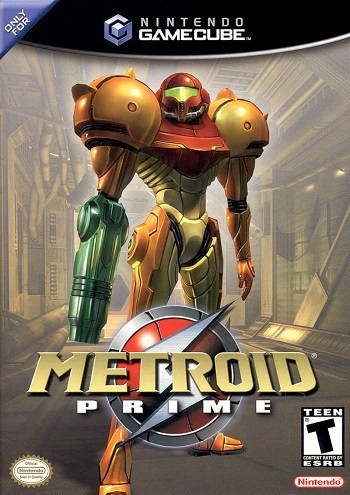 Other regions and later adaptations covered over the plot hole by re-writing the relevant story entries so that the Pirates never captured it... but, in so doing, opened two other plotholes, namely, where the armor came from and how the Pirates knew enough about it to call it Metroid Prime. Theoretically, this isn't as bad, as in either version, it interacted with the Chozo, which would better explain why it has weapons and armor that resemble Chozo tech. All There in the Stinger: The 100% ending gives a first look at what would become Samus's main enemy through the next two games — a black hand emerges from Prime's remains, having made use of the Phazon Suit that it stole from Samus to be reborn as Dark Samus. Like Samus's Power Suit, its core is protected by a heavily armored carapace with only a small "visor" as its weakspot. The Particle Wave, its deadly answer to the beam weapons. The color of its armor changes so that it can only be harmed by that specific beam weapon at a time. Its own answer to the Ice Beam is the Ultrafrigid Breath, which can completely freeze Samus in place. Multi-Missiles, where it fires a mortar of long-range missiles at you. Snare Beams, its own variation of the Grappling Beam. Always Check Behind the Chair: Prior to obtaining the X-Ray Visor, at least. Antagonist Title: Metroid Prime is an enormous Metroid residing in the Impact Crater, so mutated by Phazon it barely even resembles a Metroid anymore. Attempting to navigate an obstacle that looks passable but actually isn't (such as a barely-out-of-reach ledge underwater without the Gravity Suit) a few times will bring up a prompt telling you to come back later with the proper powerup. And if you spend a long time dinking around and wandering, a prompt will appear and mark on your map your next destination. This can be disabled if you find it distracting, or want to find out where to go on your own. If Missiles or Power Bombs are required to progress, the game will generally give them to you. The perfect example is the room where you find the X-Ray Visor, which requires a Power Bomb to escape. If you used all your Power Bombs to get to this room, there thankfully happens to be a perpetually respawning Seedling in this room that will drop one on death. The Chozo left behind writings and lore describing their encounter with the meteor and subsequent attempts to contain it. They succeeded in containing the worst of the Phazon, but significant amounts of it escaped and started poisoning everything, including the Chozo. Also present in some of the Pirate Logs when talking about how thoroughly Samus trashed their their previous operation on Zebes. Or how she's now on Tallon IV and tearing through their forces. Ascend to a Higher Plane of Existence: In the lore logs, it is claimed that the Chozo that lived on Tallon IV did this, but were pulled back by the meteor crashing on the planet. Awesome, but Impractical: The charged combos apart from the Super Missile. They do have some uses, though; for example, the Wavebuster tears through robotic enemies and can put some serious hurt on bosses like Meta Ridley or Metroid Prime (when it's weak to the Wave Beam, at least), and its auto-locking ability works great for hitting their small weak spots, as well as taking out a cloaked mini-boss that you can't lock on to normally. Backtracking: Oh, yes. Have fun combing Tallon IV to find all 12 artifacts and every single pickup! Bag of Spilling: During her escape from Frigate Orpheon, Samus gets caught in an explosion and loses all her powerups except her suit and Power Beam. She gets them all back on the planet itself. And even at the start, she doesn't have all of the power-ups she acquired from either the original NES game or its remake, such as the Screw Attack. Barrier Change Boss: Metroid Prime, which periodically changes its weakness to one of your four beams. Its second form, though, is an odd example; while it's only weak to one weapon (the Phazon Beam), it is only visible in one spectrum at a time, requiring you to change which visor you're using to actually hit it. Batman Can Breathe in Space: Meta Ridley, who actually manages to one-up this by flying directly from an orbiting space frigate to Tallon IV, note an impossible feat, considering that space has no air molecules to push against in flight, though his "flight" may have been powered by his mechanical parts, with the wing flapping as just muscle memory, surviving re-entry in the process. Battle in the Rain: It's constantly raining on the Tallon IV Overworld, so you can have mini-battles in the rain all the time. The standout example though is a boss battle in the rain near the end of the game when you face off against Meta Ridley. Big-Bad Ensemble: Meta Ridley and Metroid Prime. The Metroid Prime caused the Phazon crisis on Tallon IV; Meta Ridley led the Space Pirate operations there. Removing some power sources or upgrades releases captured Metroids and shuts off the lights. The Space Pirate Base in Phendrana is an excellent example. The atmosphere turns dim when you fight Chozo Ghosts. The first time, it is terrifying. Super Missiles, compared to the other charge combos. It is also required to beat the game (as it is used to blow up objects); the other beam combos are not. It's just a super-fast missile launcher that deals massive damage per shot, but that's all it needs to be. Also, the Power Beam itself. It doesn't do as much damage as the Wave or Plasma beams, nor does it freeze enemies like the Ice Beam. However, it can fire almost as fast as you can push the A button, making it the best weapon if you're dealing with a lot of weak enemies or you've brought an enemy's defenses down and need to deal some quick Scratch Damage before they go back up. Fittingly, the two are related; Super Missile is the missile combo for the Power Beam. Boss Remix: It's difficult to catch, but the Final Boss battle is accompanied by a remix of the Title theme. Breath Weapon: Besides Ridley, since he is a Space Dragon, Metroid Prime, Sheegoths and the Parasite Queen. Bullfight Boss: The Plated Beetle, which has bulletproof armor over its head. Bubblegloop Swamp: A good part of the Tallon Overworld. At the start of the game, Samus already has the Charge Beam and Grapple Beam as part of her arsenal, and she gets to add Super Missiles, the Plasma Beam, Power Bombs and an X-Ray visor to her arsenal later on. One item is also called the Space Jump Boots, to emphasize that it doesn't quite grant her the flight capabilities of the standard Space Jump, but rather just a double jump. Scanning the first Metroid in Glacier One will reveal the information of its home planet, SR-388. Metroid II: Return of Samus takes place on that planet, and Metroid: Fusion takes place in a space station orbiting it. Catastrophic Countdown: After defeating the Parasite Queen, this happens, a voiced countdown goes off. Thanks to the size of the station, you have an unusally long time to escape, you would have to sit around and do nothing to fail at it. Check-Point Starvation: The Phazon Mines. There's a save station, near the entrance. Better use it, 'cuz it's the last one you'll see for a long time. Getting to the next one requires you to run a gauntlet of shadow troops, mega turrets, wave and ice troopers, and two mini boss battles against an elite pirate and a cloaked drone. The drone battle is especially cruel, as it ambushes you right outside the next save station, which is blocked by debris. The only way to clear away the rubble, is with a power bomb (earned by beating the drone then navigating an electric mini maze). In all, it'll take you about half an hour or more of nonstop fighting and puzzle solving to get from that first save station to the next one. And if you die at any point along the way, you get to do it all over again. Chekhov's Gun: Scan lore in the Artifact Temple discusses Chozo statuary, ending in the line: Those who deface or destroy them will know our wrath, unfettered and raw. Much later, Ridley smashes the Chozo statues over the Impact Crater entrance, only to be finished off by the remaining ones with lasers to the chest. Circle of Standing Stones: The Chozo cipher is shown as a series of stone monoliths in two rings. The Space Pirate Beam Troopers, note in Power, Wave, Ice, and Plasma flavors, to match your beam weapons, the Fission Metroids, and Metroid Prime. Their current color is the color of the only weapon type that can harm them. The doors are colored based on what is needed to open them. The first recordable log in the game (found on your first visit to the Space Pirate Frigate) mentions the events of the original Metroid, how their base on Zebes has fallen and that the Pirates are hard at work trying to revive the fallen Mother Brain. Ridley also has a new cyborg body in the game, since Samus completely mopped the floor with him in the original. The remixed music. Tallon Overworld's first theme is a remix of the first Metroid's Brinstar, Tallon Overworld's second theme is similar to Green Brinstar, and Magmoor Caverns is a remix of Lower Norfair. Convection Schmonvection: Averted. Without the Varia Suit, Samus will take damage from simply entering an area that has lava. This only applies to Prime, as Samus keeps the Varia Suit throughout the rest of the trilogy. Cyborg: Meta Ridley qualifies. Pirate logs describe the process of, after being genetically reborn, grafting new weapons and armor onto his body. According to details given, it was incredibly painful, but he quite likes the new weaponry granted. Damage-Sponge Boss: Metroid Prime is insanely resilient, and there are no shortcuts to bringing it down. You'll spend a good 10 to 15 minutes at most just to get past its first phase. If you abuse glitches to bypass the cutscene on the Frigate Orpheon that strips Samus of her powerups, the game will take them away when she lands on Tallon IV. Thardus, a boss made out of rock and ice, takes more damage from the Plasma Beam and no damage from the Ice Beam, even though you're not supposed to have either weapon during the fight without heavy Sequence Breaking. Another example involving sequence breaking: the Shadow Drone miniboss is invisible and untargettable to your regular, Scan and Thermal Visors, but can be seen with the X-Ray Visor. The catch is that the X-Ray Visor is normally accessed with Power Bombs, which you need to defeat the Shadow Drone to get in the first place, but if you somehow get a Power Bomb Expansion and use that to get the X-Ray Visor first, you can use it to see and target the miniboss, making the fight a cakewalk. In another stranger example of foresight, you cannot just ignore the Shadow Drone because of this: one of the Chozo Artifactsnote specifically the one from the Phazon Elite miniboss needs Power Bombs to access, but will only trigger if you have collected the actual Power Bomb item from the Shadow Drone fight. You cannot cheese it with Expansions. Disney Villain Death: Ridley is pushed off a cliff by lasers and explodes. Down the Drain: The Crashed Frigate, combined with Techno Wreckage. Drone of Dread: The ambience in the Space Pirate Lab and the second level of the Phazon Mines. Dub Name Change: In the Japanese version, Phendrana Drifts and Magmoor Caverns are known as "Ice Valley" and "Lava Caves", respectively. Some areas in the former still have remnants of the original non-Japanese name, e.g. the "Gravity Chamber" is called "フェンドラナ地底湖" ("Phendrana Underground Lake"). Prime has voiceovers that were supposed to introduce each area by name; all are still on the disc, but the scripting is broken. The only trigger that actually works is transitioning from Tallon Overworld to Impact Crater or vice versa. Additionally, an introduction to Samus and what she has done was voiced over in Prime - not the one that ended up in the game by the narrator, but Jennifer Hale herself! Elaborate Underground Base: Most of the Phazon Mines area is naturally underground, and serves as the Space Pirates' main base on Tallon IV. Embedded Precursor: The original NES Metroid is included as an unlockable if you link Prime to Metroid: Fusion. It includes a save feature and a new control scheme mimicking that of Prime. The End... Or Is It? : The 100% ending: The hand from Samus's Phazon Suit (absorbed by the eponymous villain) pops out of a puddle of Phazon with an eye on the back. Enemy Scan: Courtesy of the Scan Visor. Helps indicate particular hazards and/or weaknesses. Eternal Engine: Upper Phazon Mines and Phendrana's Space Pirate base. Evil Knockoff: The Space Pirates try this via reverse engineering Samus's beam weapons, supposedly making copies of them. While they did manage to make different types of armor that was only vulnerable to one type of beam weapon, all they seemed to have managed to copy is her Power Beam, which still isn't as good as the original. On Hard Mode, the pirate's ripoff beams gain their respective Elemental Powers. Expy: Thardus is basically the Metroid universe's answer to Gorignak. Eye Open: How the 100% Completion bonus ending ominously ends. Eyes Do Not Belong There: The 100% ending of Prime has an eye open on the back of a hand emerging from a Phazon puddle, later revealed to be Dark Samus. Failed a Spot Check: A pirate log notes that Samus's gunship is invisible to their scanners and they're reduced to searching the old-fashioned way and hoping they get lucky. Fair enough, except said gunship is parked in the open, plainly visible as orange on a field of green, two rooms and less than a kilometer away from the crashed Pirate frigate. Feed It a Bomb: The Triclops enemies that often show up in the Morph Ball puzzles. They try to grab any round object they see, which might be Samus... or one of her bombs. Fire, Ice, Lightning: The Plasma, Ice, and Wave Beams, respectively. First-Person Shooter: The game is set in the genre, but puts more emphasis on exploration and puzzles than straight-up combat to fit more in line with the Metroid series, hence why Nintendo officially refers to it as a "First Person Adventure". In the Space Pirate labs, the Metroids are the only creatures that can survive more than three Phazon infusions, with the primary side effect being unchecked aggression. The final boss is an giant Metroid that has been horribly mutated by Phazon over the course of a much longer time period than the Pirates even knew about Metroids. The Stinger at 100% completion gives you a first look at Dark Samus, who would go on to be the main antagonist of the next two games. Fungus Humongous: In Lower Phazon Mines, scanning one of the giant mushrooms will state that they are around 300 times bigger than the norm for the species. The huge size is justified twice due to the fact that the Space Pirates are looking to use them as a low cost replacement feed for their Phazon enhanced units and are using compounds to accelerate and promote the growth of such fungi, as well as the fact that Phazon itself is a mutagenic substance which itself could also be helping make such huge mushrooms. Grimy Water: The water in the Chozo Ruins is initially toxic, due to a giant plant monster poisoning the water's source. Once you've defeated it, the water clears. Electrical attacks and certain other attacks (such as the projectiles launched by the Chozo Ghosts) will create static on Samus's visor for a few moments. The Sentry Drones are notable for causing an Interface Screw just by being present (flavored as being designed to mess with visor technology). Steam vents in certain areas will temporarily fog up the visor. Shadow Pirates posses an "active camouflage" type of cloak (appear as a faint shimmer in visible spectrum, but stick out like a sore thumb in IR). Trace in Hunters can cloak itself in a similar fashion by standing still, but the cloak drops as soon as it moves. The Omega Pirate has a "Chameleon Manta" which lets him become invisible not only to the naked eye but also to infrared and X-ray vision. The only time he can be seen when it's activated is when he absorbs the highly radioactive Phazon into his body to regenerate his armor. Jump Jet Pack: The Space Jump which, unlike the 2D games, just gives Samus a second jump in midair. Kill It with Fire: The Plasma Beam and its charge combo, the Flamethrower. Kill It with Ice: The Ice Beam and Ice Spreader. Duh. Lethal Lava Land: Magmoor Caverns. The Parasite Queen. Justified, since she falls right into the main reactor of the already heavily-damaged ship after you kill her. Also Metroid Prime, whose death causes the Impact Crater to collapse. Monster Closet: The first adult Sheegoth you fight pops out of a wall that was concealing a dead-end room just big enough for it. Mythology Gag: One of the spider-ball puzzles in the game is a subtle tribute to Gunpei Yokoi's old Nintendo toy, the Ten Billion Barrel . New World Tease: You can try and go into Magmoor Caverns early, but you're not getting far without the Varia Suit. That said, it is possible by Sequence Breaking. No Body Left Behind: Killing enemies with a charged Plasma Beam shot can vaporize them completely leaving behind no body. No-Sell: Chozo Ghosts are completely immune to anything but the Power Beam, which is best for scratch damage against huge enemies or fighting off hordes of weak enemies, not chasing zippy ghosts all over the room. Thankfully, the Super Missile is also "Power Beam" elemental type, homes in when you lock on, and can kill them outright in one hit on Normal difficulty. Not Completely Useless: The Ice Spreader and the Flamethrower missile combos for the Ice & Plasma Beams are generally impractical, unlike the Super Missile and Wavebuster, but there are a couple of instances where they are quite useful. The Flamethrower is the only weapon that completely bypasses the beam shields that the Elite & Omega Pirates project (making their fights much easier), while the Ice Spreader does huge amounts of damage to Metroid Prime when it's in the ice armor. Not Quite Dead: You may have defeated the exterior of Metroid Prime, but the interior still lives even after you defeat it. Oh, Crap! : Several Pirate logs found early on in the Phazon Mines are orders from higher up for the Pirates to immediately drop everything and take combat positions now that they know that the dreaded Hunter has found their base. Ominous Latin Chanting: The music for the title screen, credits, and Magmoor Caverns. One-Hit Kill: A fully charged Plasma Beam will often completely incinerate enemies you point it at. If you didn't scan a boss during the fight, you won't be able to scan them again (and thus cannot get 100% Completion). The Ice Shriekbats in Phendrana Drifts only appear in a couple rooms and won't respawn after getting the Thermal Visor, unlike all the other normal enemies in the game. For most players, this means seeing them once each in the two locations they're found in, then never again. Power-Up Magnet: Holding a charged shot will attract any nearby energy/ammo refills dropped by enemies. Raised Hand of Survival: Finishing with 100% Completion adds a brief cinematic showing a hand reaching out from the puddle of Phazon that was once the title creature. At the time the player would have no idea who or what this is: Metroid Prime reviving as Dark Samus, Samus Aran's nemesis throughout Prime 2 and 3. Reality Ensues: A Pirate log reveals that among other Chozo technology, the Space Pirates attempted to replicate the Morph Ball. They abandoned that project soon after their first few test subjects were killed via body distortion. When the original designers of a bizarre piece of technology go extinct, the knowledge of what makes it work goes with them. Red and Black and Evil All Over: Played with by Samus's Phazon Suit (which comes in a nice black, grey, and red color scheme): Samus is most definitely not evil, but the Phazon corrupting her suit is. Played straight in The Stinger, when Metroid Prime has fused with the pilfered Phazon Suit. Very early on, some of the Chozo Lore seems to point toward the big plant boss poisoning the waters as the source of the 'Great Poison' that destroyed their civilization. Of course, shortly after Samus fights said boss and heads toward Magmoor, a new bit of Chozo Lore establishes that Flaahgra wasn't half of it. There is one, and only one, item in the whole game that can be scanned but doesn't have any other purpose. The subversion makes it worse when the description says "An ornate wall hanging with a highly reflective surface. It does not appear important." Naturally, this caused many players to waste untold time and return trips refusing to accept that it's truly unimportant. Much more plentiful are little alcoves, rock facings, and other environmental cues which look like so many others you blast open and find secrets hiding behind. Thankfully, the scan visor will usually clue you in on whether it can be destroyed, as well as what can destroy it. See the Invisible: Samus faces off against the invisible Shadow Pirates. She can see them by using the infrared visor, allowing her to see their body heat. The Omega Pirate however is equipped with a Chameleon Manta, which makes him invisible to even this. The only way to see him when the Manta is activated is to wait for him to absorb radioactive phazon into his body, which will temporarily light up his insides with radiation, which Samus can see with her X-Ray visor. Using the Scan Dash glitch allows for the Space Jump Boots to be acquired before any other upgrades. The Scan Dash was removed in later versions of Prime, so Samus must perform an alternate, but difficult method by locking on to one of the Seedlings in the Temple Hall and heading backwards to the Gunship in Landing Site, before doing the rest like the NTSC version. You can get the Morph Ball early by using this glitch. Samus can get into the Furnace room without the Spider Ball by using a clipping glitch, or a Ghetto Jump. When she reaches the Hall of the Elders, she can jump on a Radiation collector to reach the room's Bomb Slot, and then practice several other jumps to get to the Reflecting Pool. Once there, she can simply stand on a Stone Toad and reach the Antechamber and Ice Beam early. This is usually performed before encountering Flaahgra. In the Japanese New Play Control! version, it is possible to do this in the Furnace using a Spring Bomb Jump. In the Trilogy version, however, an invisible wall was added to the upper entrance of Furnace's Morph Ball tunnel until Samus collects the Spider Ball, and when standing on a Stone Toad in both New Play Control! and Trilogy versions, Samus temporarily loses her ability to jump. The Plasma Beam can be reached without the Spider Ball by either successfully performing two jumps in the Twin Fires Tunnel, or by exploiting the scan dash glitch on the Spider Ball Track in the room. Then in the Geothermal Core, several jumps can be exploited to reach Plasma Processing. Getting this allows you early access to the Gravity Suit without the need for the Spider Ball. The Power Bomb Expansion in Security Cave can be reached using several difficult jumps. This will give Samus early Power Bombs and also enable early access to the Artifact of Spirit and other such items. Notably, this trick can be performed in the Metroid Prime Trilogy version of the game, despite the changes made to jumping. The Power Bomb Expansion in the Magma Pool can also be obtained early by using the infinite speed glitch. In the GameCube version, this requires the Boost Ball. The Hive Mecha can be skipped via an L-Lock Spring Space Jump. This allows for Missiles to be acquired without having a battle. Alternatively, a scan dash can also be used to escape the Hive Totem, and if Samus returns, the Hive Mecha is gone, replaced by the Missile Launcher. The Missile Expansion in Main Plaza's half-pipe can be reached using a Ghetto Jump, as another means of early Missiles. The Gravity Suit and crashed Frigate Orpheon can be skipped via Bomb Jumping over the bars in Great Tree Hall. Set a Mook to Kill a Mook: In any place where there are both Metroids and Pirates, you might be able to steer the Metroids into attacking the pirates. If one latches on, the victim pirate is as good as dead. Shaking the Rump: Whenever Samus exits her ship, she does a hip-check before heading off. Shoulder Cannon: The Elite Pirates have shoulder-mounted plasma cannons. The Omega Pirate has two. Silence Is Golden: There is almost no spoken dialogue in game; the only lines include the Frigate system alarm saying "Evacuate Immediately!" and the Omega Pirate occasionally roaring a barely intelligible "Finish her!" during his fight. Samus only makes grunts of pain now and then, and screams whenever she dies. The icons denoting a scan point carry the symbol of the twelve artifacts. A little more subtly, you will see the shape of Samus's visor in three places: first, it's what you look out of; second, it's the windshield of her ship; and third, it's the large panorama window of the Artifacts Room. So Near, Yet So Far: The entrance to the Impact Crater is located just a few rooms away from the landing site of the Gunship, but you can't actually go down the entrance until you find all the Chozo artifacts. Static Stun Gun: The Wave Beam, which is a Lightning Gun this time, stuns enemies for a few seconds. It also makes turrets go berserk for about 10 seconds and then explode. Shriekbats (and Ice Shriekbats) are hard-to-see colonies of bats which hang from doorways and divebomb Samus if you get too close (not to be confused with Flickerbats from the same game, which are actually invisible, but fly around open areas and are more for decoration). The unique Cloaked Drone, which is constantly invisible (aside from the glow its weapons produce), which also makes it the only enemy which can't be scanned. The Chozo Ghosts have the ability to turn invisible as they move about, making them hard to shoot until you find the X-Ray Visor (which shows invisible enemies). Sprint Shoes: Replacing the Speed Booster from Super Metroid is the Boost Ball, which allows the Morph Ball to get bursts of speed to climb half pipes, activate spinners, and generally allows faster movement. Truck Driver's Gear Change: The first theme of "Tallon Overworld" uses this; it starts off in the key of G Mixolydian with no clear melody, switches to Tonicized C once the melody starts to kick in, switches to F Mixolydian soon after, and the second half of the song switches and climaxes in the key of Bb Mixolydian. It is entirely possible to free Metroids in rooms containing other enemies (like Space Pirates), then leave the room (unless the door locked behind you) in Prime. And then there's the room that actually encourages it: There's a force field keeping Metroids penned up, with Space Pirates in a lab on the other side. This force field is in your way. The controls can be scanned from too far away for the pirates to notice you, and you can easily wait in the upper section for the Metroids to finish off the Pirates. Raiding the Space Pirates' base as much as you want with all of your upgrades. The joy in this is to use every piece of weaponary on them as much as you want. If you use a cheat, you can use the Phazon Beam and torture them while in Hyper-Mode (first Prime's version, not Corruption). In the Chozo Temple's grand entryway, you can see a bird-like species flying in the sky. Careful aim will reduce them to an explosion of feathers. There is no advantage or reason to do this except to twirl your Snidley Whiplash moustache. Womb Level: The Impact Crater, which contains what look like bones and giant teeth. Doubles as The Very Definitely Final Dungeon.